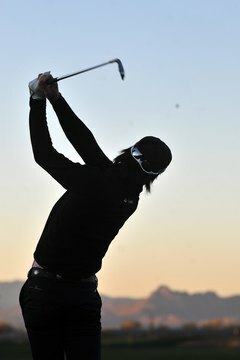 Frequent practice on the range or course will help to groove the proper swing techniques over time. A good golf shot begins before you even touch the ball. As you approach the tee, look at the flag and visualize your tee shot. Then begin your pre-shot routine, which should include a check of your grip, your posture and foot position. Align your club and your body to the pin, think positively, and whack the ball with enough club speed for a high-quality golf shot. Have a golf professional recommend the correct grip for you. Most golf pros use the overlap grip, with the little finger of the right hand resting between the index and second finger of the left hand. For beginners, juniors or women with small hands, the side-by-side baseball grip may produce better results. Grip the club between the first and second joint of the index finger back to the pinkie. The heel of your hand is on top, and the thumb is toward the back. Assume the correct posture. Push your hips back and up with your chest lowered. Your weight should be toward the balls of your feet. Release the tension in your knees, arms and shoulders. Your feet should be as wide as your shoulders for a tee shot with a driver. For other clubs, place your feet as wide as your hips. Aim the club face and your body toward the pin when you address the ball. Your feet, hips and shoulders should be square to the pin. When practicing, some players lay a club down to help with alignment. Another good way to align yourself to the pin is to step back from the tee and visualize the shot. Pick out a spot a foot or two in front of the ball that's in line with the target and aim at that. Complete your backswing. Turn your shoulders as the upper body rotates around the spine. Your left arm can be bent slightly as you bring the club back to the point where the left shoulder approaches the right armpit. Hands, arms and shoulders should work together smoothly in the takeaway. By the time your left arm is parallel to the ground, your wrists should form a 90 degree angle. Shift your weight to the back leg during the backswing. Move the left knee toward the target as you begin your downswing and transfer your weight to your left side. Allow your body to uncoil and slide toward the flag. Hold your wrist hinge on the way down. Extend the arms at impact and straighten the wrists. The shaft of the club and the left arm should form a straight line at impact. Follow through with your weight on the front foot and your chest facing the target. Keep your front foot down while you pivot the back foot. Your back heel should be up when you finish the swing.